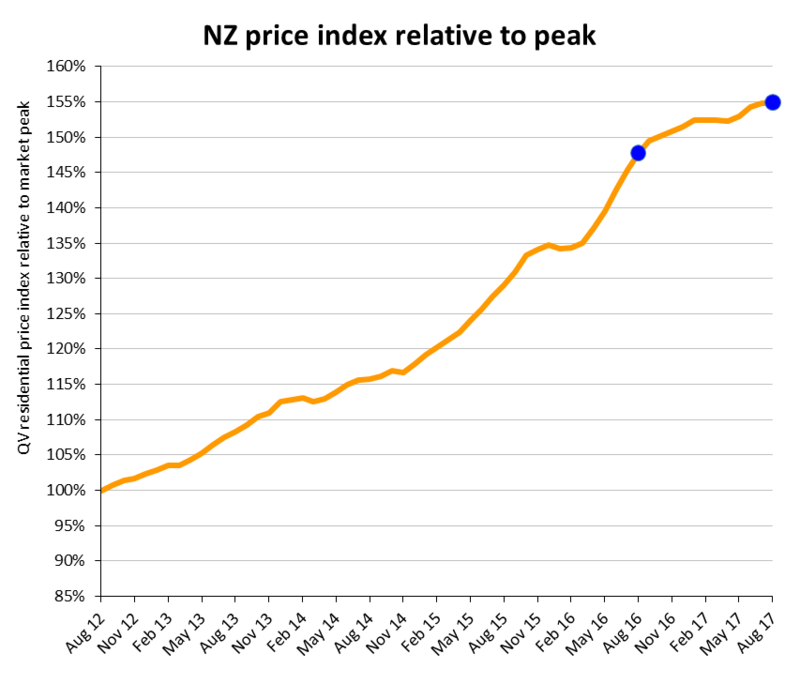 The latest monthly New Zealand QV House Price Index shows nationwide residential property values for August increased 4.8% over the past year which is the slowest annual rate since August 2012. Values rose by 1.2% over the past three months and the nationwide average value is now $641,648 which is 54.9% above the previous market peak of late 2007. When adjusted for inflation the nationwide annual increase drops slightly to 3.0% and values are now 29.3% above the 2007 peak. Residential property values across the Auckland Region increased 2.8% year on year which is the slowest annual rate of growth since October 2011. Values dropped by 0.2% over the past three months. The average value for the Auckland Region is now $1,041,957 and values are now on average 90.7% higher than the previous peak of 2007. When adjusted for inflation values rose 1.0% over the past year and are 59.1% above the 2007 peak. Values have dropped in some parts of Auckland over the past three months including Rodney North down 3.2%, Papakura down 2.5%; Franklin down 2.2%; Waitakere City down 1.1% and parts of Manukau and the North Shore. However, values rose in other parts of the city including Auckland central suburbs and also Waiheke Island which saw the highest rate of growth up 3.9% over the past three months. Hamilton City home values rose 1.4% over the past three months and 5.0% over the past year. Values are now 50.6% higher than the previous peak of 2007. The average value in the Hamilton is now $544,469. Tauranga home values increased at a faster rate than Auckland, up 9.6% year on year and 1.7% over the past three months. Values there are now 44.2% higher than the previous peak of 2007. The average value in the city is nearing $700,000 and is sitting at $694,361. Western Bay of Plenty increased by 9.9% year on year and 1.8% over the past three months and the market is now 36.1% higher than the previous peak of 2007. The average value in the district is now $613,073. The QV House Price Index shows values in the Wellington region increased by 12.9% over the past year but have dropped 0.4% over the past three months. Values in the wider region are now 32.9% higher than the previous peak of 2007. Christchurch City values continue to plateau rising just 0.1% year on year and they decreased slightly by 0.4% over the past three months. Values in the city are now 30.0% higher than the previous peak of 2007. Dunedin residential property values continue to rise but at a slower rate than earlier in the year with quarterly growth having slowed to 0.5% over the winter months. Values rose by 12.6% in the year and are now 31.3% above the previous peak of 2007. The average value in the city is now $375,814. Nelson residential property values rose 13.6% year on year but quarterly growth slowed to 1.9% over the past three months and values are now 40.5% higher than the previous peak of 2007. The average value in the city is now $538,136. Meanwhile values in the Tasman District have risen 16.1% year on year and 0.6% over the past three months and are 34.0% higher than in the previous peak of 2007. The average value in the district is now $538,256. Values continue to rise strongly across the Hawkes Bay region. Napier values rose 18.8% year on year and 5.3% over the past three months. The average value in the city is now $459,393 and values are now 35.0% above the previous peak of 2007. The Hastings market also continues to see strong value growth rising 18.4% year on year and 2.9% over the past three months and the market is now 36.6% higher than 2007. The average value there is now $425,780. Values Central Hawkes Bay have jumped 7.8% over the past three months and 24.5% in the year since August 2016 as buyers look further out of the main centres for more affordable property. Most areas of the North Island have seen values rise over the past three months with the exception of parts of the Wellington and Auckland regions. Values are now rising in many areas that have not seen strong growth for many years including East Coast areas including Gisborne and Wairoa as well as central North Island areas such as the Ruapehu District and Whanganui. In the South Island, values continue to rise in many areas including the Tasman, Nelson, Marlborough Districts as well as in Clutha, Central Otago, Waitaki and the Queenstown Lakes District. However values decreased 5.5% over the past three months in Kaikoura following the earthquakes there and values were also down in Southland, Invercargill, the West Coast Districts of Grey and Westland, in Hurunui, Ashburton and many parts of Christchurch as well as on the Dunedin peninsula. The QV House Price Index can be accessed here.